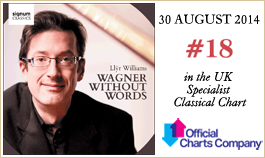 Welsh pianist, Llŷr Williams, is widely admired for his profound musical intelligence, and for the expressive and communicative nature of his interpretations. He has worked with orchestras around the world, including the BBC National Orchestra of Wales, Scottish Chamber Orchestra, London Philharmonic Orchestra, London Symphony Orchestra, BBC Philharmonic Orchestra, Hallé Orchestra, London Mozart Players, Sinfonia Cymru, I Pomeriggi Musicali, Meininger Hofkapelle, Berner Kammerorchester, Limburgs Symphony and the Mozarteum Orchestra in Salzburg. He also appears at the BBC Proms in London and has given many remarkable performances at the Edinburgh International Festival, including an astonishing performance of Charles Ives’ 'Concord' Sonata in 2010. He is a regular performer in the Wigmore Hall’s main piano series. Llŷr Williams is a regular performer at the East Neuk Festival in Scotland, Handelsbeurs Concertzaal Gent, and in the Piano aux Jacobins series in Toulouse. He is also currently artist in residence at Galeri Caernarfon in Wales. 2010 saw the release of a solo CD featuring music by Mussorgsky, Debussy and Liszt, on the Signum Label. In 2012, a second disc was released by Signum, featuring works by Liszt. Both discs were met with critical acclaim. Also available is a live recording from the 2012 East Neuk Festival, containing Beethoven’s Op 109 and Op 110 sonatas. Llŷr Williams is the subject of two films produced for S4C: the first of which won a Welsh BAFTA for Best Music Programme, and the second featured his debut at Carnegie Hall. A regular collaborator with violinist Alexander Janiczek, they have performed at the Wigmore Hall together, and given a full Beethoven series in Perth. Llŷr Williams also has a great love of lieder and he is one of the official accompanists at the BBC Cardiff Singer of the World Competition. Born in 1976 in Pentrebychan, North Wales, Llŷr Williams read music at The Queen’s College, Oxford and went on to take up a postgraduate scholarship at the Royal Academy of Music where he won every available prize and award. He is also an Honorary Fellow of the Royal Welsh College of Music and Drama. He was an active member of the Live Music Now! scheme for several years, was selected for the Young Concert Artists in 2002. From 2003-2005 he was a BBC New Generation Artist and in 2004 received a Borletti-Buitoni Trust award.